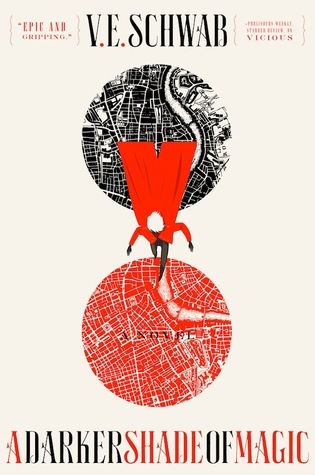 To Sum It Up: Kell is one of the Antari, one of the few who possesses magic that enables him to travel between alternate versions of London: Red London, Kell’s home; Grey London, where King George III sits on the throne; and White London, ruled by twins with an insatiable hunger for more power. Black London has long since been sealed off to travelers, destroyed from within, but when an extremely dangerous object from that forbidden place finds its way into Kell’s hands, he knows that he must return it to its origin, no matter the cost. 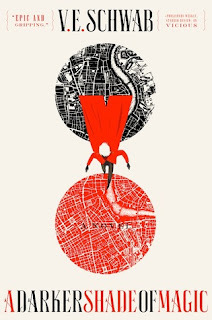 Review: It took me about a month to read A Darker Shade of Magic, and let me tell you, that had absolutely nothing to do with the book itself. Nope—it had entirely everything to do with lots of real life stuff imposing on my reading time. I had to read this in bits and bursts, when all I really wanted to do was devour it in one sitting. A Darker Shade of Magic is the kind of novel that demands—and deserves—your undivided attention to the point where you wish that you could just press a pause button for the rest of life so you could curl up with this book. Hey Kell . . . maybe a little help here with that? Aside from Harry Potter, which I regard on its own plane of amazingness, I don’t know if I’ve ever been so thoroughly impressed by a book about magic. Every time our hero Kell cast a spell, I got a little chill because the magic felt so real. The world-building is absolutely stunning here and leaves you with no doubt that alternate Londons could exist in parallel. I found the four Londons utterly fascinating, even the versions that didn’t sound quite as appealing to visit. Each London is given a distinct vibe, and whenever Kell journeys between them, it’s as though you’re right there beside him and not simply reading about his travels. Like the Red London that he calls his home, Kell is an endlessly intriguing protagonist. One of the first things we learn about him upon being introduced is that he dons a very unique, multiple sided coat. And like everything else about the world of A Darker Shade of Magic, of course you believe that such a coat exists. Kell is every bit as faceted as his coat is, too; it’s hard for me to individually list all of the reasons why I love him because I just love everything about him, including his flaws. It’s his little smuggling operation that rains a heap of trouble down on his head, but were it not for Kell’s rather large dilemma, we wouldn’t meet the wonderful Lila Bard. Lila is a thief from Grey London who aspires to be a pirate. Yes—a pirate! How freaking cool is that?! It’s very fortunate for Lila that she’s so game for adventure because once she crosses paths with Kell, there’s a lot for someone who’s unaccustomed to magic to absorb. But Lila is keen to leave her London behind, even though Kell warns her of the potential dangers of the travel for a non-Antari, as well as what may await them in the other Londons. These two—despite their occasional squabbling (which is very amusing, by the way), they make an incredible—and formidable—team. There’s some seriously intense action in this book, thanks in part to Holland, an Antari like Kell, but that’s about where their similarities end. Holland oozes lethality with every word and every move, which isn’t surprising when you get up close and personal with the folks he answers to. They would Astrid and Athos Dane, the twin rulers of White London, where the throne has traditionally been seized by force. Not only are the Danes more than okay with striking down anyone who gets in their way, but they revel in their cruelty. And they’re crazy. As much as I wanted to see Astrid and Athos’s horrible reign end, I have to say that they were compelling antagonists; you never knew what their next move was going to be, only that it involved copious amounts of evil. Guaranteed. Finally, I must mention how exquisitely written A Darker Shade of Magic is; it’s as though the prose itself is enchanted. Nothing makes me happier than reading a book that makes me fall in love with its words as well as its characters, its setting, etc., and I adored EVERYTHING about A Darker Shade of Magic. I cannot wait to catch up with Kell and Lila in the next book! All in All: Simply brilliant. This is truly one of the best, most immersive magic books I’ve read, and I don’t know what else to say to convince everyone to read it, too! I'm so excited for the next book! The cover is beautiful, and I'm sure that the story will be equally amazing! In the meantime, I absolutely need to read more of Victoria Schwab's books! OMG! OMG! OMG! I NEED THIS IN MY LIFE!!! I could read about these characters and this world for FOREVER. Everything about this book was sheer perfection!